Spices and Herbs used in Mangalorean Cookery. Gas Measures for Oven Baking. This hearty and healthy /low fat daal is packed with the goodness of spinach, it is simple to make and an excellent accompaniment to white rice/ chappatis. Spinach is well known to be a nutritional power house. It is rich in calcium required for strong bones, vitamins A and C plus the fiber, folic acid, magnesium and other nutrients which help to control cancer. Folate which helps protect against heart disease. The flavonoids in spinach help protect against age related memory loss. Spinach's secret weapon, lutein, makes it one of the best foods in the world to prevent cataracts. Daals are hearty and healthy full of proteins, vitamin B, folate, iron, cholesterol lowering soluble fiber and gut regulating insoluble fiber, helps in maintaining a healthy heart, blood and nervous system. 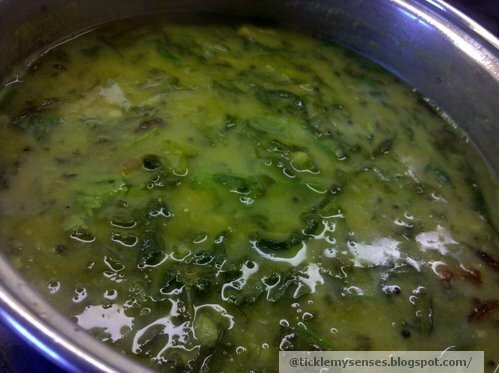 So why not treat yourself to a bowl of this yummy healthy spinach daaliso saar....! Frozen whole spinach- 3 large cubes or 3 hand full of whole washed spinach leaves roughly torn. 1. Place all the ingredients for spinach daaliso saar in a pressure cooker with 3 cups water and salt. Bring to boil on a medium heat with lid closed and pressure weight on. Allow 2-3 whistles. Take off heat. Let pressure drop completely before opening cooker. 2. Mash daal using back of a big metal spoon. I like my daal thin for rice and thick for chappatis, so accordingly add hot water. 3. Next for seasoning, in a vessel, heat oil ,add mustard seeds, when splutters add small red chillies and curry leaves and fry, add cumin seeds when lightly brown and aromatic, pour in daal. Bring to boil, check for salt. 4. Sprinkle over chopped coriander leaves and squeeze half a lemon juice over daal , boil for another 2 minutes, then turn off heat. Spinach daaliso saar is ready. Serve hot with chappatis or plain rice. Thanks for posting these recipes. I have tried the Daaliso saar and the Neer dosa. It was awesome. The pictures are awesome but still don't do justice to the yumminess of these recipes. Keep posting! and best of luck with everything. Dear Susan....thankyou for stopping by and for leaving me such a lovely comment......your comment is very valuable to me and brings me great joy!! So glad you liked the neer dosa and daaliso saar!! PLss keep visiting and Happy Cooking! Nominated for Best Food Blog. Eid Mubarak and A Delicious Muslim Biryani Recipe!! Goan Pork Ribs and a Free CookBook?? Simple Mangalore Tomato Saar or Tomato Soup without lentils. Caribbean Fruit Cake for Christmas!! Spicy Lamb Mince Curry with Fenugreek leaves using a Pressure Cooker. Steamed Bananas, Steamed Nendran Bananas. Owner's Delight n Neighbour's Envy- Goan Pork Sausages Curry with Potatoes and Peppers! Mangalorean Fish Curry with Coconut. Join My Blog and Follow me! This work is licenced under a Creative Commons Licence. All the pictures and contents on Tickle My Senses are protected by Copyright Law and should not be reproduced, published or displayed without the prior written permission from me. Information on Tickle My Senses is not to be used in any form of publishing on other websites, commercial purposes or other media without explicit permission from me. Thank you for visiting Tickle My Senses.